Hos Pilates B tilbyder vi løbende særlige træningsevents og workshops hvor vi går i dybden med teknik eller særlige temaer indenfor den klassiske Pilates. This will be Karens first visit to this part of the world. Therefore she looks extra forward to meet all you lovely Scandinavian Pilates Teachers! Above all, we hope to see you for some days of great fun with Pilates friends and collegues from Denmark and the rest of Europe! There is one Pilates method and Karen master it to the fullest. To sign-up TODAY please follow THIS LINK! OBS! If you are you enrolled in the comprehensive education at Den Danske Pilatesskole – The Danish School of Pilate – part of this workshop will be incl. in your program and fees. Joe Pilates invented the apparatus to help his students build the strength and flexibility to do his mat workout correctly and efficiently. Learn how to get the most out of our all important tools – the springs, straps, handles and bars to create an efficient and effective workout. These insights will help you to see and correct imbalances, get your clients to “squeeze the juice” out of every exercise, and bring your teaching to a new level! Have you ever planned a private lesson, only to find your client injured, or having an off day? How do you go beyond the prescribed choreography to create an effective lesson for each client on the fly? Join noted teacher Karen Frischmann for a full day’s exploration into the art of the private lesson. Watch and learn as Karen crafts lessons in real time for a variety of clients. 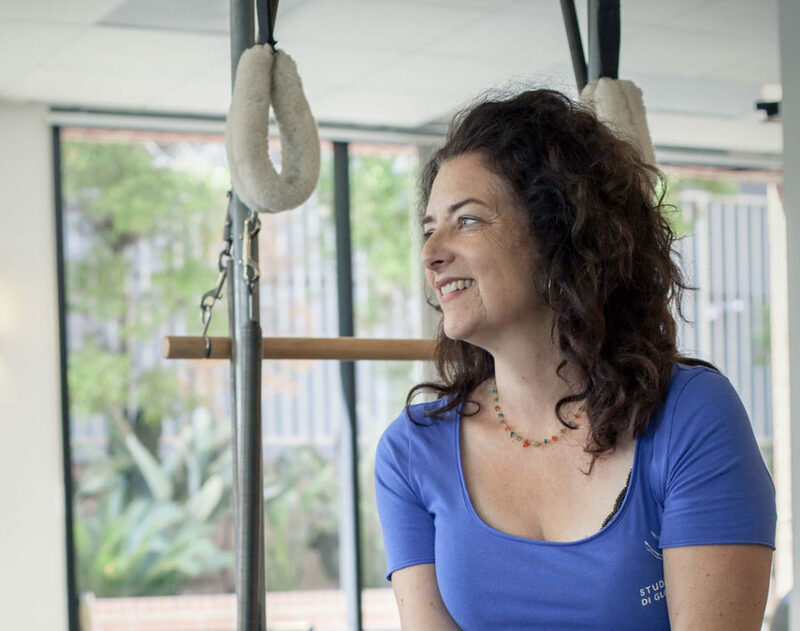 As she teaches, Karen will explain what she sees in each client, and why she chooses each lesson’s corrections, exercises and underlying theme for the person in front of her. Then join Karen for group workshops where you can explore in depth the questions and observations from the day. The classical Pilates Mat is often the place where we start our beginning clients and the ultimate challenge for our most advanced. Join Karen Frischmann for a complete breakdown of the classical mat workout. We will take an in-z depth look into the exercises, examine the logic and importance behind the order, discuss “helper” exercises on the other apparatus to achieve a stronger connection and understanding of the most difficult exercises. This includes exploring the importance and use of the straps and handles on the traditional mat and the transitions needed to knock you and your clients workout out of this world. At times we may breakdown or need variations exercise on the reformer due to a student’s specific weakness, physical limitations or as an introduction to the exercise. This workshop will cover how to breakdown exercises on the reformer without losing their integrity and intent. We have the order, we have the exercises, but the magic of teaching happens in between. How creative can we be and still stay true to the tenents of classical Pilates? When do your solutions Become not Pilates? How can you problem solve a tricky imbalance when there isn’t a direct answer? When does an exercise modification hinder a client’s advancement and when does it support it? What are the pre-Pilates exercises and when would you use them? Learn the answers to these questions And more in “Teaching Between the Lines”. As Pilates instructors we are required to communicate with our students in many ways. Our job as Pilates instructors is to best communicate our knowledge of the method and create a program of exercise best suited to the client in front of us. But where do we start? This six-hour workshop will explore the art of teaching with the senses and how to best communicate with our students in the language that they best understand – whether it be visual, aural, tactile or by rote. Through abstract exercises and practical application learn hone your strongest method of communication and build strength in those with your are less comfortable. Pilates B is run by Sara Schytz and has a great record of hosting events and workshops with international presenters. Follow us on the website, Facebook, Instagram or our Newsletter to get info on new happenings.